More adventures of blogging at My Cozy Corner. The crisp white monogrammed napkin and the simple white flatware adds to the Spring medley tablescape. 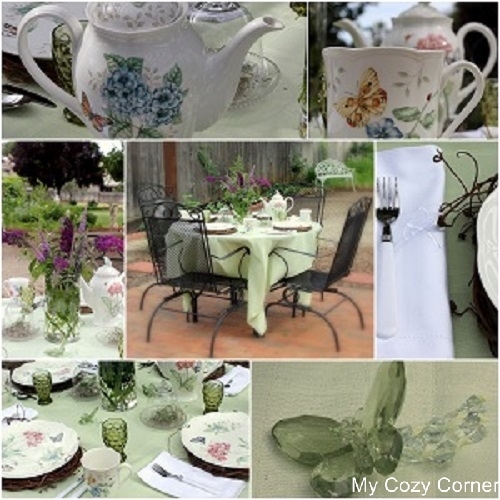 Butterfly Meadow Lenox china for a cuppa of tea, coffee or hot chocolate. I love my little cloche nesting a glass butterfly. Butterflies here, butterflies there, butterflies everywhere. Vintage green juice glass to serve a sweet nectar drink. The scallop edging on the china adds a wonderful detail especially with the grapevine charger and the vine tendrils next to the light green tablecloth. The beautifully detailed tea or coffee pot with a delicate butterfly on top. A sweet little butterfly landed on my tablescape. Would you like to join me for brunch, afternoon tea or an early dinner? Hope you have enjoyed a visit to My Cozy Corner. Sweetheart and I are working on a big project in our French Country Kitchen. I will be back later this week if our project moves along smoothly. Psst...Thank you so much for your wonderful comments. Amei seu tablescape. Lindas suas borboletas. Que capricho! Ohhhh so pretty! Love the gorgeous details and those butterflies in the cloche...Wow, great job!! Hi Betty! Oh, this is such a beautiful table and beautiful setting. I have these same dishes and they are just so pretty! I need that coffee server! :) You flowers are so lovely! Hope you had a wonderful Memorial Day. Oh my, what a pretty Spring tablescape. 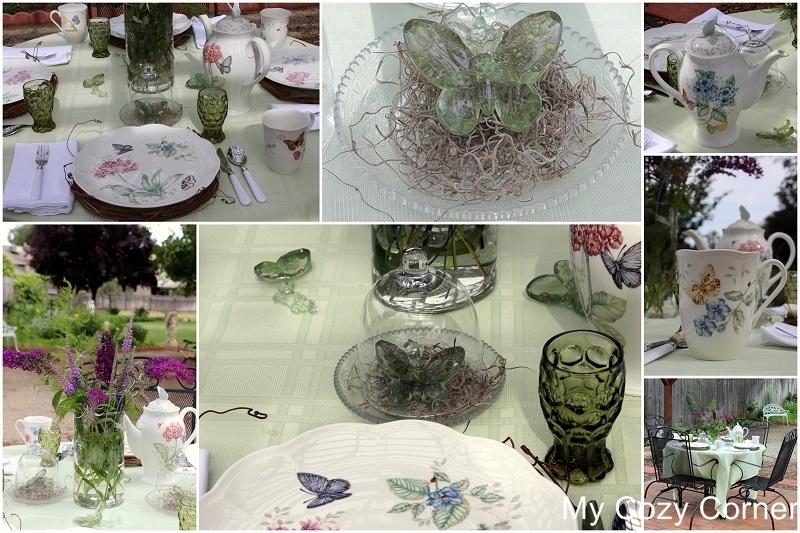 I love all the butterflies and your china pieces! The butterfly under the cloche is a sweet touch. Thank you for sharing and coming to tea. Can't wait to see the transformation of your kitchen; love French Country! Have a beautiful day, Betty. This is ended one Spring pretty tablescape. I love every inch and every color combo. Betty your table is beautiful! I love outdoor tables and butterflies! What a lovely setting. Perfect for the garden. The napkins are wonderful, so crisp and white. Very pretty! Dining outside is definitely a summer hilight!